S: You’re a sort of master builder when it comes to book forms. 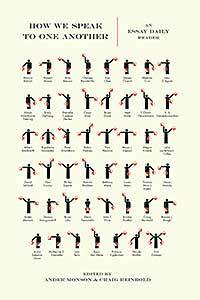 My favorites are your books that involve moving parts. These seem at once game-like (Cat's Cradle, The Guide to Higher Learning, Personal Paradigms) and machine-like (Full-Circle, True to Life). 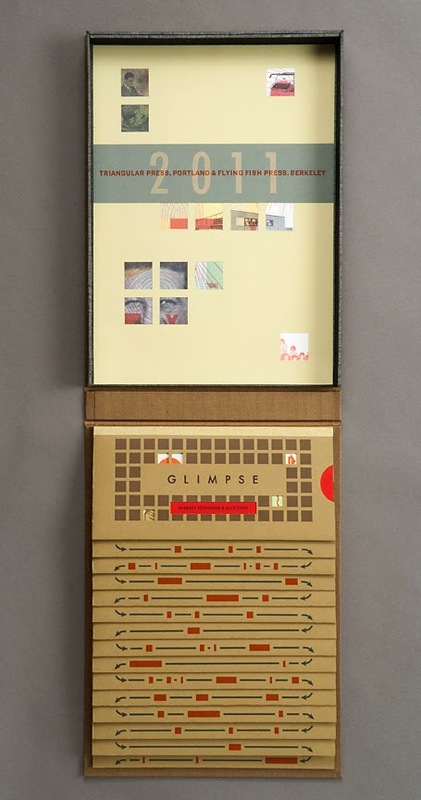 When I consider the mechanics behind multimedia work, Glimpse seems a great example of how a structure moves to physically describe the process of what some call essay or memoir writing--how real life events become narrative visual form. I wonder if the machine-like qualities of your work are intended to draw attention to the process of combination, especially by placing it in the hands of the viewer. Why do you think your books so often, and in so many ways, ask viewers to handle and actively experience them? J: What I am trying to do in my work is give the reader a physical experience of reading/viewing. The activity of reading a typical (non-artist's book) book is basically a visual one for most people: You take in the content with your eye. This is especially true with e-books, but is also somewhat true even with paper books. The object itself is perceived mainly as a carrier for content (This is of course not the case for people in the book arts and graphic design who tend to be much more aware of how the type, images, paper and binding are all affecting the reading experience). My interest in approaching the book as a medium for art is to get people to interact with the physicality of the book, and to experience the activity of reading haptically. The book form can be so much more than a carrier for content: The book as object can be a significant contributor of the content along with text and image. I have never really considered the "machine" aspect of my work, but it's an interesting idea that I will give more thought to. S: Cool. I like thinking of the "book as object" as a sort of third element in the experience as well. In regards to games, chance seems a force considered in both the text and forms of your work. I wonder sometimes at the presence of chance in work that combines two media--when and how do pairings happen? Can you talk a bit about how, or if chance plays a role in your own process, and if pairings of text and image seem to happen on their own or "by chance" for you. J: Funny you should ask this question as chance is something that I have not considered with much in my work, until now. My latest book, Family Tree, consists for 16 wooden cubes with text and image on all 6 sides. One of the reasons I chose this form was to take maximum advantage of the idea of random access of content. There are actually 2.8 trillion permutations possible with 16 cubes. I haven't, of course, tried even a fraction of that number, although I designed the piece to allow for a very wide range of possible meaningful permutations to occur. It all depends on what any individual reader chooses to focus on. People will always search for meaning, so I have a feeling that even though chance can play a significant role in the reading/viewing process, people will tend to gravitate towards combinations of content that they find meaningful. The other piece of mine that utilizes chance as a significant factor in the reading/viewing process is Personal Paradigms. 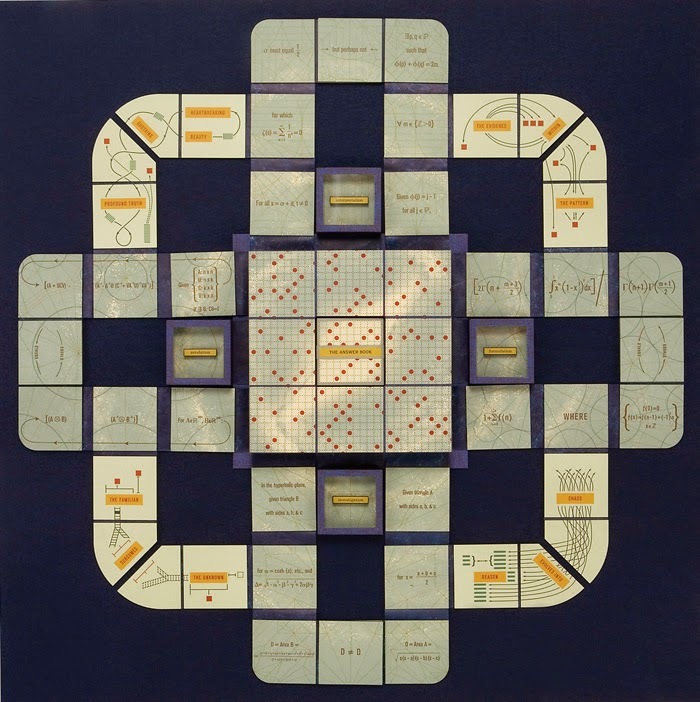 Because this piece was designed as a game, chance allows the reader/ participant to enter into a content-making space with some of the decisions pre-made for them. This shortens the process, and also allows the participant to (hopefully) feel freer to make meaningful combinations of ideas that were selected randomly since they do not have to own all the decisions, but instead have to make the best of what they randomly selected. Some limitations in the process of art making are almost always beneficial as being told you can make absolutely anything would paralyze most people, at least temporarily. In general, though, I orchestrate how text and image interact in my work very carefully. In order to give the reader a specific experience of content, I feel I have to control how content is revealed/delivered, except in instances such as with those examples described above, where chance is an intentional contributor to the reading process. S: Content-making space. Yes. Which medium do you begin with to get to this point with a reader? Is text always present from the beginning? Or do visuals ever come first? J: The way in which a project begins varies a lot from piece to piece. Once I choose a subject, it can just as easily be structure or image that is the starting point rather than text, although I do have to say that the development of text usually starts fairly early in the process. Once I start working seriously on a piece, everything develops together. I might spend a few days working on the text, but then put that aside to work on image or structure. For me, the book usually develops in an integrated fashion. It's almost never a question of the piece being built around a single sacrosanct element such as the text. Rather, every element is up for adjustment in order to make the piece work. In some instances, a breakthrough about book structure has caused both the written and visual content of a project to be radically adjusted. This was the case with Panorama, which started out to be a much smaller format book. It wasn't until the voice of the structure fully emerged that it turned out that the piece needed to be very large in order for it to really speak. This involved a lot of adjustments to both text and image after the printing had already begun. S: “The voice of the structure fully emerging” is a really wonderful description of this process. Can you talk a bit more about that moment? I’m curious about instances of emergence like this in which one or both media adjusts so the two can work better together. Does happen for you often at the end of a big project? What do you think brings emerging about? J: Often when I begin a piece, I only have a vague or very simplistic idea of I where I'm going, but I've learned to trust the process. While moments of emergence sometimes seem to happen suddenly, like a seemingly random flash of inspiration, they really only happen as the result of allowing myself to think about a project over a period of time. I try not to place too much emphasis on the early stages of working on a piece with the goal of finding an answer or solving a problem, but rather of exploring whatever it is that is pushing me in the initial direction that I'm going in. I try to hold things as loosely as I can for as long as possible, and am still often surprised at the unexpected directions that projects sometimes go in. It's always less stressful if these moments happen on the front end of a project, but I've definitely had big changes in my thinking happen midway or even later in a project. There is usually a moment though, after which big changes are totally unfeasible, and once that point arrives, a lot of soul searching happens about whether or not the new thing is really vital to the project. S: At the heart of this interview series is a search on my part for a language of craft that describes when and how art+text functions. 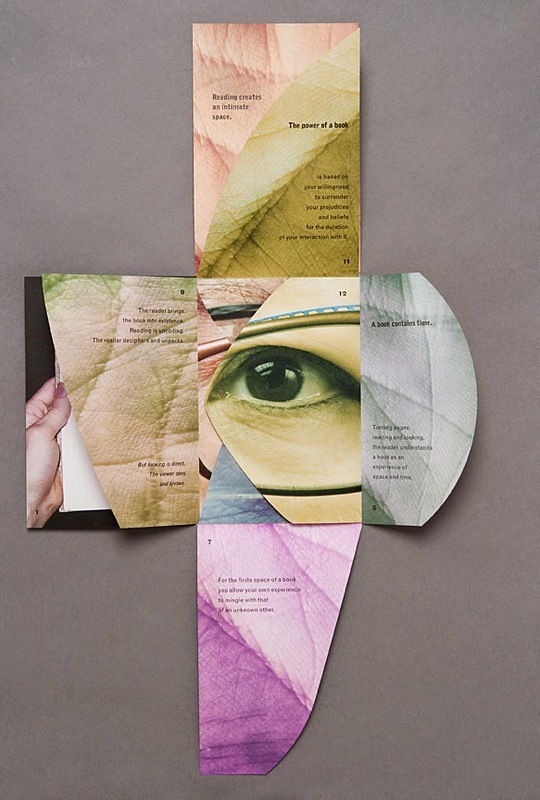 Do you have terms for the ways words partner with visuals successfully in the book arts? I can see how some might describe this quality simply by naming the binding type or book form, but there seems something more to be said about how ideas are conveyed via a codex vs. a tunnel book, and that this is about more than the echoing of content and form. J: I definitely think the way in which text and structure works together is more than just one echoing the other. I don't have any specific language to describe how text and structure work together but do think that it has something to do with the way we perceive objects. If the object in question is a traditional codex book, even the most informed of book art audiences is going to automatically go into "codex mode", meaning they have subconsciously prepared to read in ways in which a typical codex is usually read. When the book in question turns out to not follow known or expect rules, people will quickly adjust their expectations and respond to what is actually happening in the book vis a vis the text. But that initial assumption about the object is something that book artists who use the codex form simply have to be aware of and figure out how to subvert. 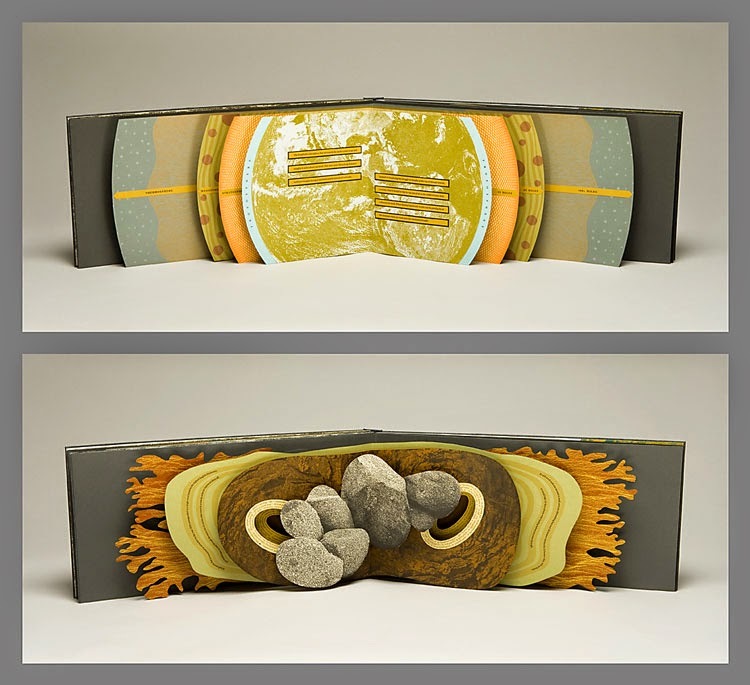 With non-traditional book forms, the expectations are much less ingrained, although with informed book art audiences, there will certainly be some kind of preconceived expectation with known forms such as the tunnel book or flag book. But even so, our cultural expectations about what a codex "is" is so much more ingrained in our thinking that people are much more willing and able to have open minds when it comes to reading text in non-codex formats. S: There’s something really curious going on here in the way audiences learn to perceive and experience objects containing text that has to do with the lens of “book as object.” I once heard your work described as "sculptural vessels for the written word," which I liked, but I’ve been treading lightly lately in labeling which media carries the other when combination is involved, especially from calling forms "containers" because I like to think that the components carry equal weight, not one another. Do you ever think of your material/physical work as a vessel for its language? Do you have another means to describe the relationship? J: I definitely do not consider the physical part of the work to be a container for the content part of the work. The physical object, including the structure, materials, and media is a full partner with text and image to create the meaning of the piece. They are separable on a technical level, of course, but take any one element away, and the whole thing loses its identity. I don't really have a single word to describe the relationship of text and image to the physical object, but this question makes me realize that I should come up with an articulate way to explain this. S: I like the term “partner” here because of its nod to dance, and because it suggests something like a marriage (which seems an overused term in multimedia circles) that is based more on the work at hand rather than a pre-arranged agreement, but maybe it's my idea of marriage that's the problem there. Among the makers I'm interviewing for this series, your work might push the idea of "text" the furthest. Many of your pieces reside in museums, as well as libraries, but are produced in often very limited editions. Where, in an ideal world, would an audience encounter your work? How much does the issue of audience come up for you? What about the argument about how few people encounter an artist's book in their lives? Are the book arts not a form dedicated to the masses? J: I have been asked this question many times before, and I would like to answer with a question: Why is a limited edition perceived as being inaccessible when there are a number of copies available for viewing (as opposed to other types of art such as painting and sculpture where there is only one)? In the case of many of my editions, such as Panorama, there are 100 copies in the world, many of which reside in libraries. All it takes is for someone to go one of those libraries (in some cases, there is a need to make an appointment) and the book will be placed in their hands. 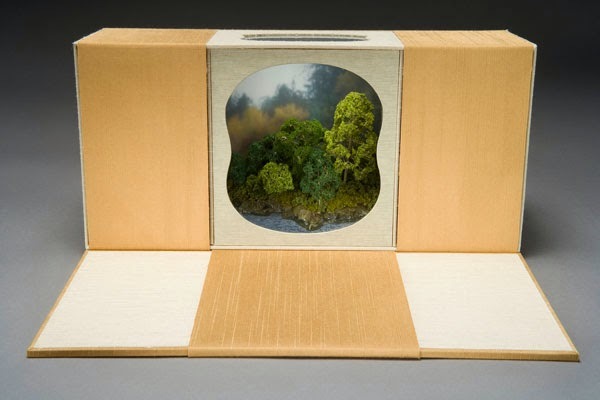 Unlike unique works of art that are only accessible when they are displayed in exhibitions, the limited edition artist's book actually is quite accessible. Interested parties in most regions of the US could see one of my books without too much difficulty by going to the special collections section of the nearest university library. Even if a person happened to know that an institution owned a painting, sculpture, or even a print, it is very unlikely that they would be able to access those works when the pieces were not on display. In regard to the second part of your question about books being a form dedicated to the masses, I agree with the premise, but make the distinction between books and artists' books. I think book artists are like other type of artists: we make work for an audience and want our work to be viewed and/or experienced. Do most artists make work that is dedicated to be experienced by the masses? I think the answer is no. Should books in their general form (as opposed to their artistic form) be available to the masses? Of course. Do some book artists have the intention of creating artists' books with the intention of disseminating them to the masses? Certainly. Is that my intention as an artist? Not really. While I do want my work to be experienced by as many people as possible, it is intended to be an intimate experience between the reader and the book. The technical complexity of what I am doing, and my belief that the materials, media and structure of the piece all contribute significantly to the experience of the reader, along with the content, means that my production is generally necessarily limited to relatively small editions. But I do feel that they are very accessible by art standards. S: That’s well said, and raises some important distinctions. Your first question addresses how the book arts span two mainstream medias that place perhaps incompatible expectations on the form. This makes me think: Is this because the process of making an artist's book is more book-like, and the reproducing and accessing is more art-like? Or is it still somewhere between—that a piece of book art is more accessible than a painting but less than a novel and access will always be imperfect? Or perhaps the publication process for book arts is fitting after all, because it mimics the doubled-nature of book art even after the physical work is complete. You situate yourself and your intentions more in in the camp of visual artists, and your work is certainly accessible by those standards. But as multimedia image+text work morphs further to include more text-heavy works, do you think the right place for the artist's book will always be in a special collection—somewhere between a museum gallery and the stacks of a library?—or might the ways we reproduce and access these works evolve with their mediums? J: While I understand the impulse to want to move artists' books from the library to the gallery, I have conflicting feelings about this. While I do consider what I do to be visual art, I also firmly believe that my books have to be handled in order to be experienced fully. This makes the library model much more in keeping with the type of interaction that I am wanting my audience to be able to have with my books. There is a gallery in the Bay Area, Seager Gray Gallery in Mill Valley, that has an annual artist's book exhibition every Spring. Donna Seager, one of the owners of the gallery, has maintained a hands-on approach to these exhibitions, allowing viewers to handle the books with white gloves, creating a type of hybrid experience between a library and gallery such as you mention in your question. Unfortunately, the gallery has had to scale back on this approach due to wear and tear issues on the work in past exhibitions, although Donna will be happy to show anyone a book page by page if asked. The idea of a hybrid space in which artists' books are treated as art, but which also allows viewer/readers to interact with the works as in a library, is something to strive for. S: True that. It seems our spaces of display are behind in the ways they prompt or dissuade interaction with the things displayed. Thanks, Julie. 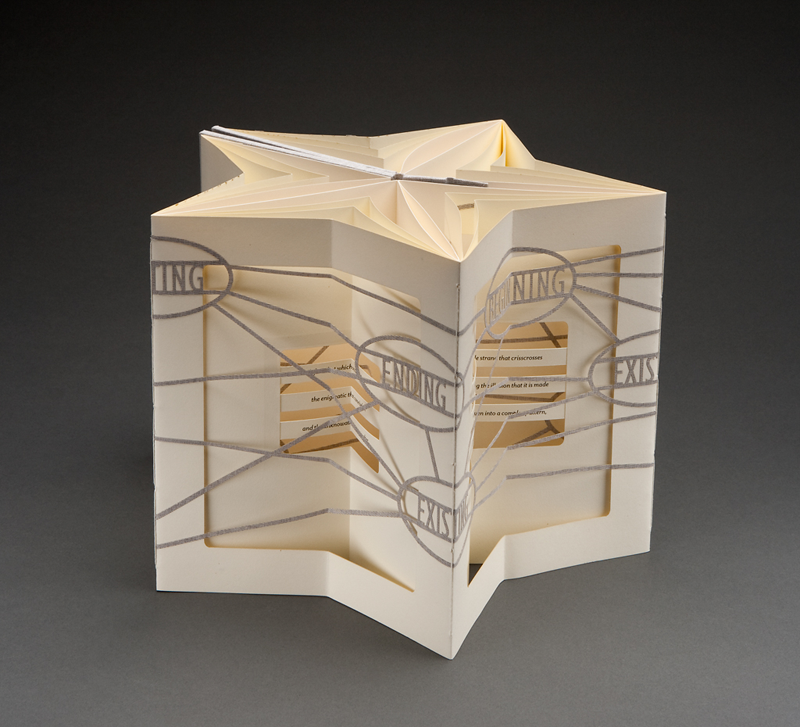 Julie Chen is an internationally renowned book artist and educator known for her work that combines text with three-dimensional, movable book structures, and fine letterpress printing. She has been producing limited-edition book works under the Flying Fish Press imprint for the past 25 years. Chen’s artists’ books can be found in many collections including the Museum of Modern Art, New York, and the Victoria and Albert Museum, London. She teaches in the book art program at Mills College in Oakland, California, as well teaching workshops at institutions around the country. She lives and works in Berkeley, California. See more of Chen’s work here. All images courtesy of Flying Fish Press. Sarah Minor is from the great state of Iowa. She is a PhD student in Creative Nonfiction at Ohio University, and holds an MFA in Creative Nonfiction from the University of Arizona. Her visual essays have appeared or are forthcoming in Word Riot, Conjunctions, Seneca Review, Black Warrior Review, South Loop Review, and PANK. More here, soon. Melanie Bishop on "It Will Look Like a Sunset"